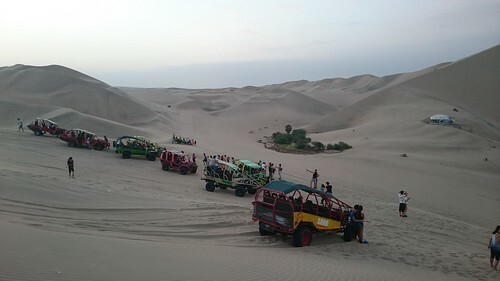 Our bus got into Ica at just after 8, and after getting a brew at the terminal, we stepped outside into a sea of tuk-tuks, all clamouring to take us to Huacachina. We haggled one guy down from ten soles to a more reasonable five, given the distance was only about 5km, and after being dropped off in what could ostensibly called the "centre", we set about finding a place to stay. 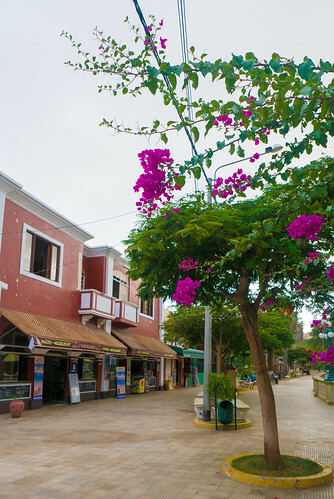 We ended up in La Casa de Bamboo, one of the quieter hostels in the area which had a bright spacious double room with en suite. 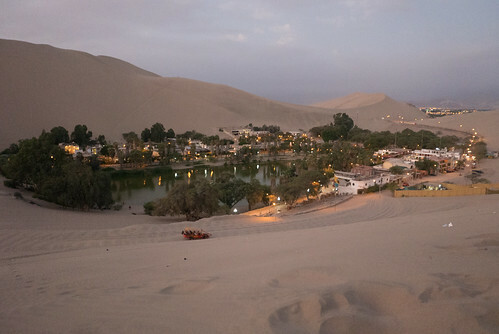 Huacachina is an oasis village. 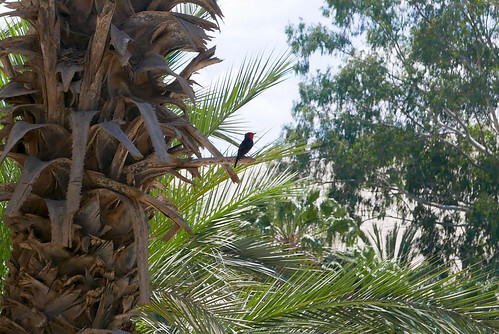 Its entire population (about 100) live around a huge lake in the middle of a sprawling desert. 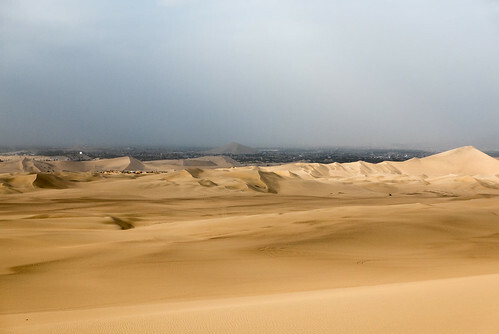 Its popularity as a tourist destination is due almost entirely to the huge dunes surrounding the village and tourism is its primary industry, with dune buggies literally everywhere. You can walk around the lake in about ten minutes, which we did, before getting some lunch at Desert Nights, one of several western restaurants dotted about the lake. 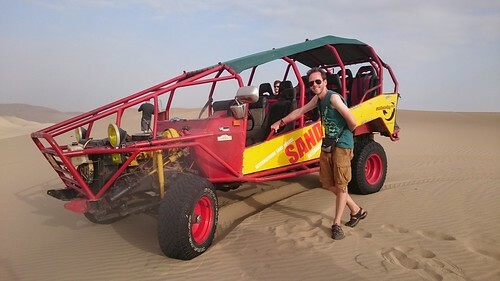 We only planned to stay here for a day, so whilst at Desert Nights we booked onto a dune buggy and sandboarding tour for the late afternoon. 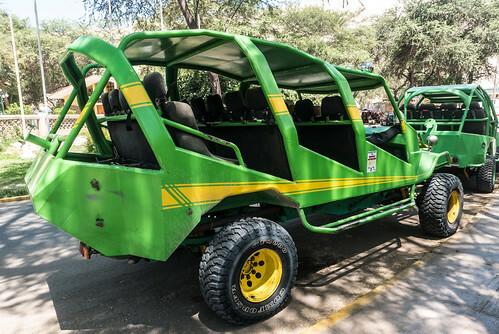 The buggies are basically metal roll-cages with an engine strapped to the front, but they have enough power to ferry 10 people up steep dunes...and then down again. 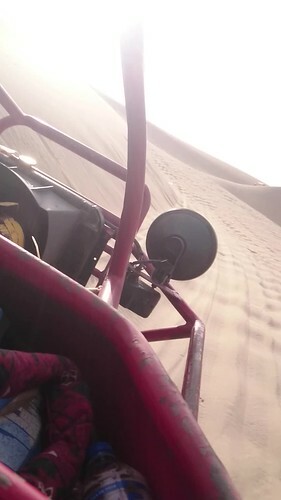 The desert is a natural rollercoaster, and the driver seemed to know his way around it pretty well given that it's all, well, sand. 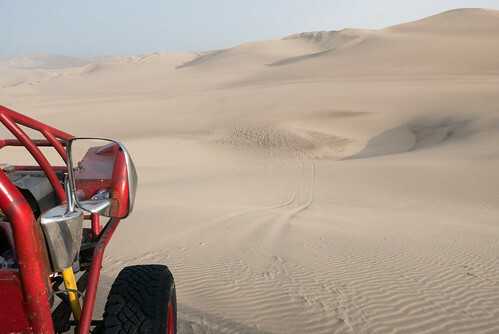 We weren't alone: there were a good 15-20 other buggies hurtling about too, but despite that we didn't end up sharing any of the dunes with other people. 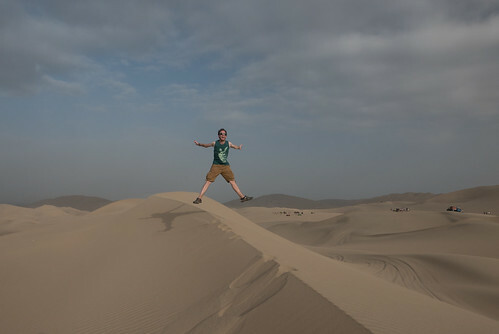 This was our first sandboarding experience since the one in Chilé where I almost broke my neck. This time we weren't standing, but lying down flat. This felt a lot safer. 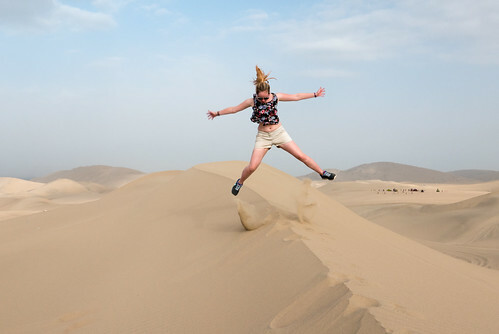 We were taken up to the top of a number of progressively steeper dunes, given a board and some wax, and then pushed down the sandy hill to the bottom. It was exhilarating. 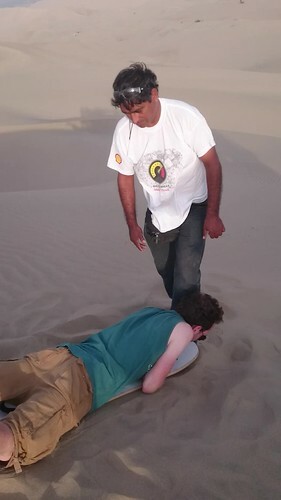 A couple of guys who were with us decided to try sandboarding standing up, despite the fittings being nothing more than a bit of rope. One of them had never done it before in his life, but hurled himself down anyway and somehow managed to come out of the experience alive (although he had a couple of bruising falls). 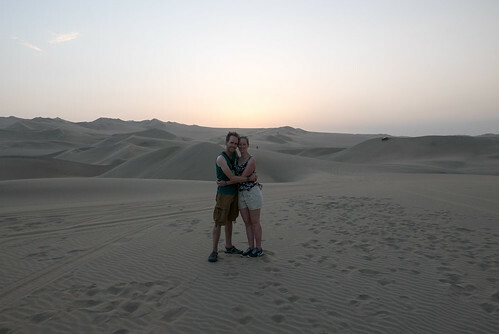 After all of the adrenaline had worn off, we were driven to a viewpoint over the oasis for sunset. It's remarkable that the village has managed to carve out an industry in such a harsh environment - it's testament to South American ingenuity. 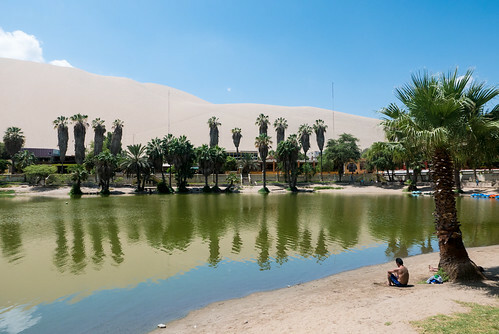 The oasis is natural, but is still topped up mechanically as there wouldn't be enough water to support all of the businesses otherwise. We sat and watched the sun go down and the village slowly light up. We had falafel and Thai curry at Bamboo for dinner before popping over the road to Banana's Adventure, a party hostel with some rather dubious cocktails. We only stayed for one since we were exhausted after cramming so much into one day, and since we had a bus to Lima lined up for the next morning we collected our laundry and had a relatively early night.